This is a well paced and informative read without the epic amounts of padding that seem to come with so many promising titles. It's not *strictly* about how to *break up* with your phone entirely. 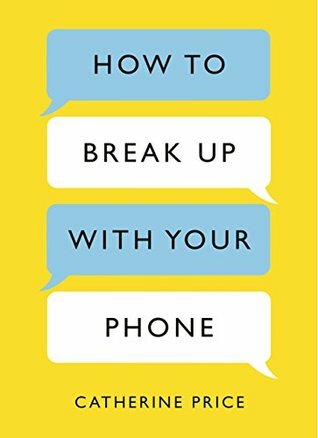 Rather, the author unpacks a strong case and gives very practical steps to take control of the relationship so the smart phone can be a tool and fun without stealing the emotional energy and attention we know we'd rather be giving to things that matter in life. The first half of the book weaves together anecdotal and research-based evidence for the ways in which smart phones have been detrimental to our quality of life. By open admission of the creators of WMDs (Wireless Mobile Devices), they are designed to be addicting, and the evidence shows that they have us hooked. I like the tone the author takes. She presents the evidence without haranguing the reader, emphasising our choice to take it and do something or move on if it's not for us. there was no guilt tripping or accusation. I found the exposé of just how insidious and strategic the commodification of our attention has been was starkly disturbing. The second half of the book was the 30 day plan, which wasn't the selling point for me as I am some way along the road of detoxing my digital life already and was just looking for something to keep my resolve on track. However, this section is full of practical advice, hints and tips, and encouraging testimonials from people who have reclaimed big chunks of life from the influence of these devices. So I didn't do the plan, but I gleaned some good reinforcements. I think the plan would be great for those who can stick to these sort of things. Again, the author's 'take it or leave it; your choice' approach was refreshing.